Here’s a familiar figure. 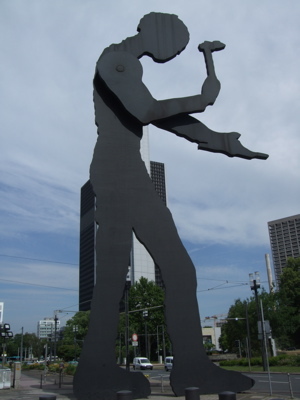 Many of you will recognize the “Hammering Man” statue from the courtyard of the California Market Center in downtown Los Angeles. 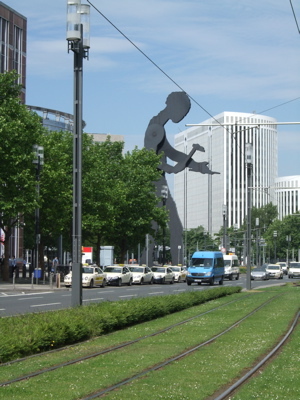 While traveling in Germany, I nearly missed my train stop when I spotted the same statue in front of the Messe Frankfurt convention center in Frankfurt. Only unlike the merely huge version at the CMC, this one is 70 feet tall. California artist Jonathan Borofsky created the Hammering Man in the 1980s and exhibited several versions of the mobile sculpture over the years. 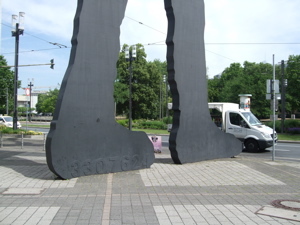 In addition to the versions at the CMC and in Frankfurt, there are Hammering Man statues in Seattle, Dallas, Seoul, Korea and Basel, Switzerland. (Fun fact: Borofsky also created the Ballerina Clown on Main Street in Los Angeles’ Venice neighborhood.) The CMC’s sculpture was purchased by the Morse family when they owned the CMC, then called the CaliforniaMart. Pretty fitting for a sculpture that sits at the hub of Los Angeles’ fashion business—and, in Germany, at the location of Texprocess, a new trade show that highlights every segment of the apparel industry supply chain. In German(y): Hammern des Mannes or is that Mann, der hammert?